Can Scented Cat Litter Cause Hot Spots on a Cat's Skin? Chemical compounds and dust in litter cause allergies. Both kitty litter allergies and hot spots are skin inflammations that may leave Kitty with raw, red skin. However, litter allergies do not cause hot spots. Watch Kitty to diagnose her skin condition and provide the best course of treatment with the help of your veterinarian. While allergies are a common cause of hot spots or acute moist dermatitis, this type of dermatitis has different symptoms than cat litter or litter box dermatitis. Additionally, they tend to occur on different categories of cats. Cats with long fur and those relocated from cold climates to hot, humid ones may be more likely to develop hot spots. 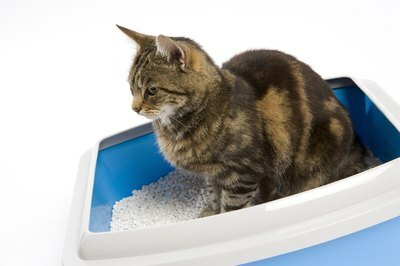 Senior cats, young kittens and cats with other allergies tend to experience litter box allergies more than healthy adult cats since it's an immune condition. Acute moist dermatitis, commonly called a "hot spot," occurs occasionally in cats. In a hot spot, Kitty's fur will be missing and the underlying skin will be red and moist. Look for chronic scratching, which signifies that Kitty feels itchy. The infection may start out small, but will spread if not treated. If Kitty licks the area, this keeps it moist and incites spreading. Common symptoms of litter allergies include sneezing, runny nose, watery eyes and excess scratching. Since Kitty sits in the litter box to do her business, you may notice red bumps, inflamed skin or crusty skin around the feet, tail and rear end. Kitty will scratch these areas, causing loss of fur and leading to sores. She may start spaying in the home to avoid litter contact. If you suspect Kitty is allergic to her litter, try her on a brand that contains no fragrances and no silica dust for at least two weeks. If she still has symptoms of litter box dermatitis, try a brand that contains clay. Your veterinarian can diagnose cat litter allergies by running a blood test. If you suspect Kitty has a hot spot, schedule a vet appointment and ask him about an over-the-counter hot spot spray to soothe Kitty's itching. Cat Owner's Home Veterinary Handbook; Debra M. Eldredge, DVM et al. Are Pomeranians Prone to Skin or Food Allergies? Can Clumping Cat Litter Cause Obstruction?